The number 4 gets little glamour. It’s rep is stability, squareness which isn’t all that exciting on the face of it. But really it is everything there is, come forth from the One. Four is the number of wholeness and completion of a created thing, in that nearly every complete thing can be divided into four aspects, or four stages. The compass is divided into the four directions, from whence issue the four winds, is just one example of a whole thing justly divided. Oddly the tarot is not divisible by four, and yet four is essential to it’s structure. The tarot minors are divisible by fours into the four suits, and these are the four elements. We all know that. These four directions which are also the elements which are also the suits are also the letters of the divine name YHVH or (IHVH). Each thing is not synonymous but each has an affinity. First there is the point, which extends to the line, which becomes a plane, which becomes a cube. 1- The first point is a dot, a flame, a Yod, the suit of Fire. You can see it as a dot in a field of nothing. 2- Next we the point extend itself as a line extending infinitely across the horizon; the surface of the Water, He primal. 3- The line becomes a plane in all directions; three points allow for the making of a triangular plane, the Vau for the element of Air. 4- This plane becomes a cube, having four sides of four points, and an above and below. This is solid matter, for the element of Earth, He final. This is a complete thing. This is our world. This is us. This is a story of creation. We are the Four, and as such also the Three and the Two and the One. The four sides, are the four suits. Is there a suit for the above and below? The Majors could certainly qualify, having doubly the number of cards for a suit, plus two more. Let us say the two extra cards are the Fool and the Universe. Kether and Malkuth. Us upon the earth. 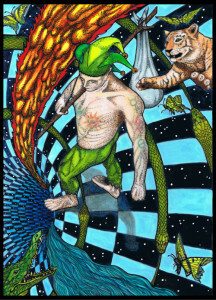 So we have the Fool, then beginning with the Magus we have the sequence of 20 cards for the above and the below, and then we have the Universe. (Which Minors are above and which below? Do they do double duty? It may not be relevant.) 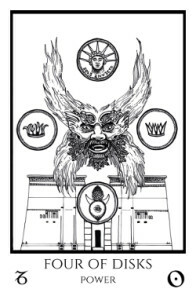 On the Universe card, traditionally there is a Zero shaped wreath or portal surrounded by the four Kerubic beasts, each at one of the four fixed points, containing the four watchers. Here the point beginning in the Fool has expanded into the cross or the cube. Four is the sephira of Chesed, ruled by Jupiter. Jupiter, whether you consider it fire or air (and it is both though in different fashions) is all about expansion. One could say expansion drives the Point out in the four directions. But it also contains the Point at its core, just as Chesed, and the Fours, are like the Kether of the world below the Abyss. The next time you feel like a square, remember that you are a cube. Divide that square into four and realize that you have four sides and that united, they encompass the above and the below, connected. Kether is in Malkuth. 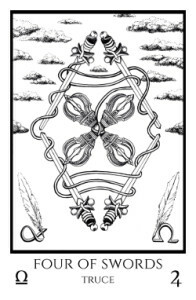 In the minor arcana, the fours are both stable and unstable, in that energy coming from One, Two and Three (the Supernals) is on an ultimate trajectory downward towards the next sephira, and that is the disruption of Geburah and Mars. That doesn’t mean they aren’t a pleasant place to rest, because they are. The Four of Wands: Completion. 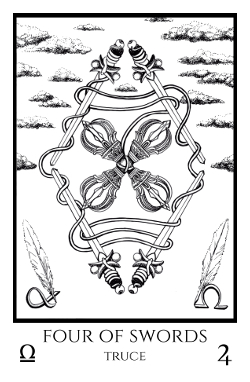 This card combines the Bee and lunar symbolism of the Empress, with the Eagle and Sun, and compass and square, of the Emperor. Together they are Nuwa and Fuxi, creator god and goddess of Chinese mythology. Here one rests after creation. The Four of Cups: Luxury. 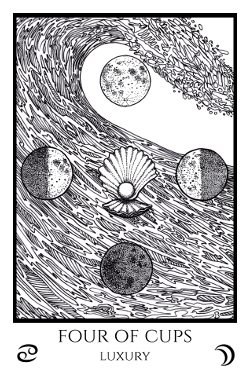 The great wave from the Chariot card crests, and the four phases of the Moon are from the Priestess card. Central is the pearl coming out of it’s shell. One enjoys luxury while it lasts. 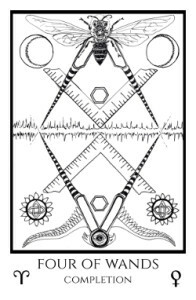 The Four of Swords: Truce. The treaty is written with the feathers of Adjustment and Fortune, as the vajra-shuttle brings the four together. Here one enjoys the refuge of truce. The Four of Disks: Power. 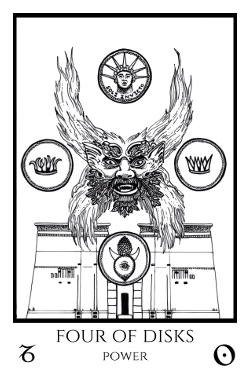 Between the pylons, the green man of craving from the Devil’s belly guards the solar currency of Sol Invictus from the Sun card. The trappings of power are a fortress.